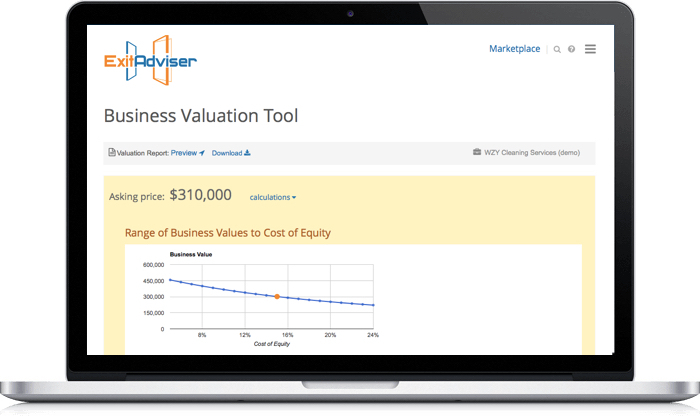 For a quick and very rough estimation, a free business valuation calculator can be used. These calculators are very simple, requiring only a few figures as an input, hence often leading to fairly inaccurate estimates of the company value. It is our recommendation that the values provided by these calculators are not used in final decision making. When you need a more accurate estimate, we recommend using more advanced valuation tools which are completely automated (i.e., the user inputs the data and the system calculates the value of the business automatically). These valuation tools may combine multiple valuation methods and require inputting more data, which means that the estimates are more reliable than the ones you get from the simple valuation calculators. In addition to valuation calculators, some companies offer services that use a team of experts that perform the company valuation based on the data provided by the business owner. We describe these valuation services but do not provide any reviews of them, for we cannot unfortunately evaluate the quality of these services. Usually free business valuation is used as a customer acquisition tool by, e.g., business brokers. 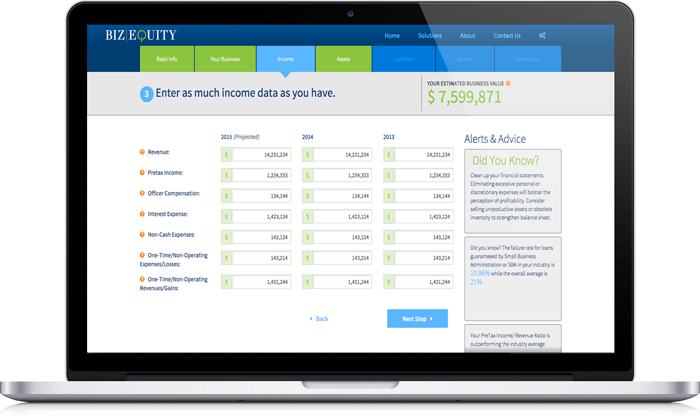 BizEquity provides a web-based solution that is easy-to-use. Equidam is a mixture of a software company and an evaluation advisory that offers a nice online tool for DCF-valuation. ExitAdviser is a comprehensive solution for business owners who are willing to move forward with selling their business. For users that are just looking for a quick simple company valuation calculator, one based on DCF method is provided on the ExitAdviser web site. 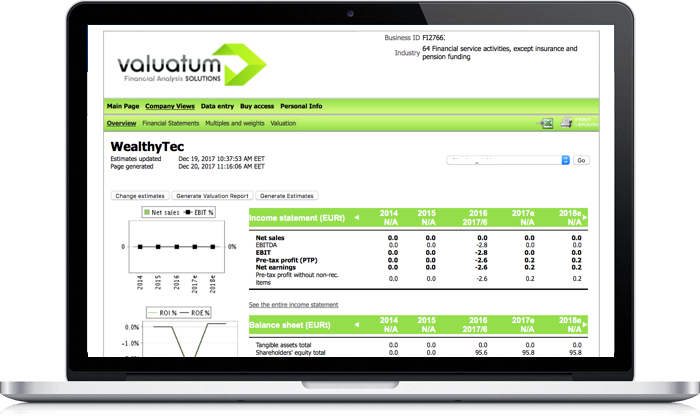 Valuatum Estimator company valuation tool is a web-based solution aimed at small business owners who are looking to find out the value of their business. ValuSource has several different packages for different user profiles. Their package for professional use can be chosen to suit IFRS or GAAP accounting standards. The evaluation is done by using either eight, eleven or eighteen methods. The most advanced package uses three asset-based calculation methods, five income methods and nine market approaches. In their more advanced packages, the weights of the methods can be customized. Due to close collaboration with Microsoft, the formulas, formats, and reports are easily customized in Word and Excel. 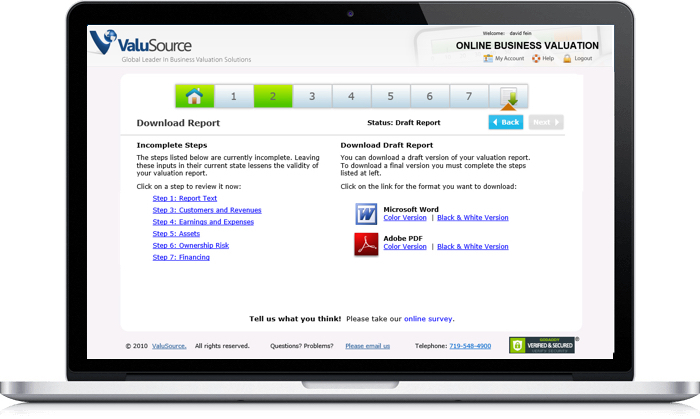 ValuSource also allows you to use their previous Excel files including financial numbers to calculate valuations. Several sample reports can be found on the website. The website also has an extensive library of video tutorials. 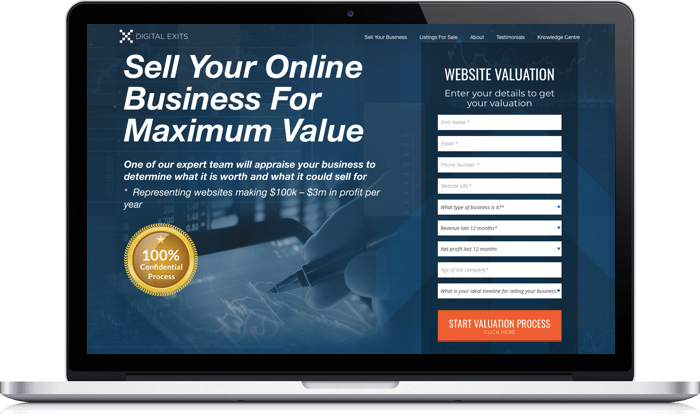 ValuTrax provides a web-based solution for company valuation at a reasonable price. 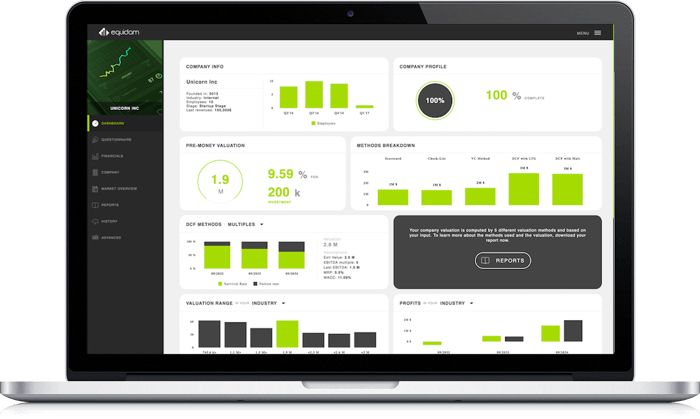 Value of the company is calculated based on income statement and balance sheet data inputted by the user, and market data. 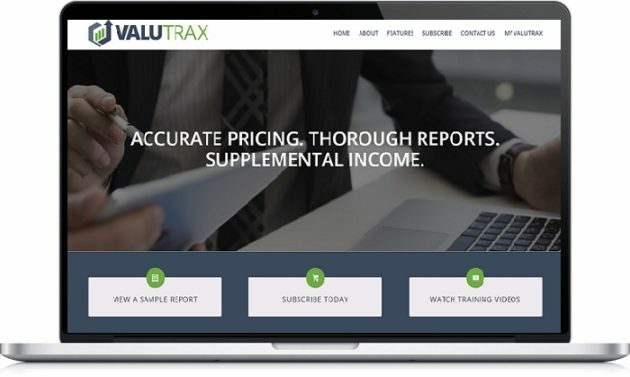 ValuTrax provides a free 14-day trial (credit card required). Otherwise the cost is $299/year. BizEx provides valuation services, such as advisory, for both business buyers and sellers. They also provide a free business valuation calculator on their website. The valuation report can be saved by leaving contact information. The free calculator requires you to input data including sales, depreciation and some other figures to determine the discretionary earnings of the business. It also requires you to answer few questions about earnings trend and risk factors of the business as well as choosing the industry business is operating in. The calculator provides a valuation based on the discretionary earnings and calculates a valuation multiple of the earnings. Here is more information on the free business valuation calculator. No other information on the prices is given on the website. Smergers is an Indian company that focuses especially on businesses operating in the emerging markets. 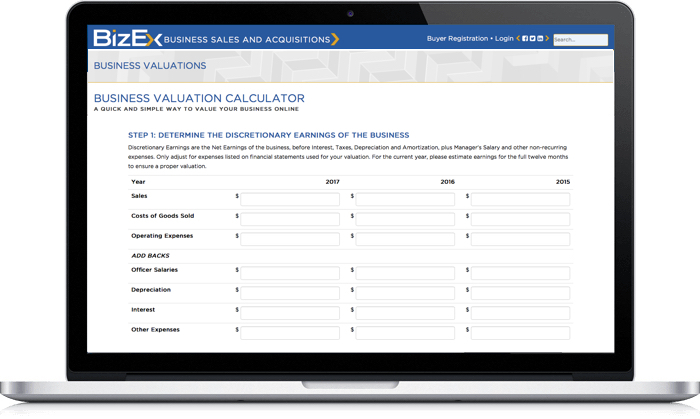 They offer a free business valuation calculator on their website that uses EV/EBITDA as a multiple to determine an approximate value for your business. Their database consists of more than 25,000 peer companies operating in several industries. Here you can find a review of the free calculator. For a fee of approx. 300 € they provide a detailed business valuation report compiled by their team of professionals using several valuation methods, including DCF and valuation multiples. This requires the business owner to submit additional documents after which it takes Smergers 20 business days to prepare the report. Smergers’ main business is providing a service that brings businesses and investors together. For a price of approx. 650 € business owners may purchase Smergers’ full services including an option to list the business for sale on their website. If a sale is initiated as a result, Smergers charges a 1 % founders fee. MHA Monahans is an independent chartered accountancy group based in UK. 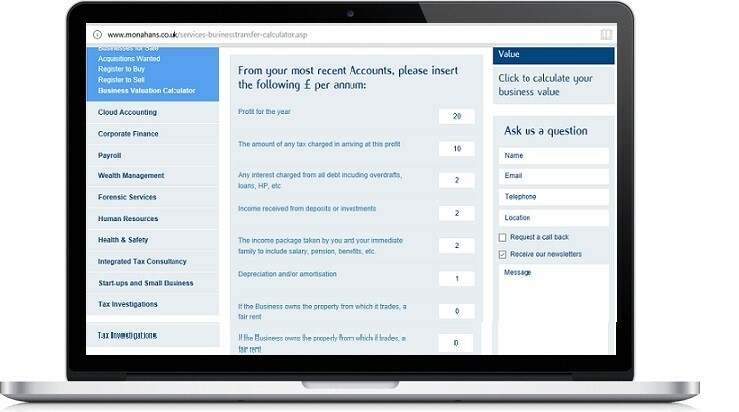 In addition to providing a wide range of services including Audits, Business Insolvency and Recovery and Corporate Finance, they help business owners to sell their businesses and offer a nice and simple online Business Valuation Calculator. 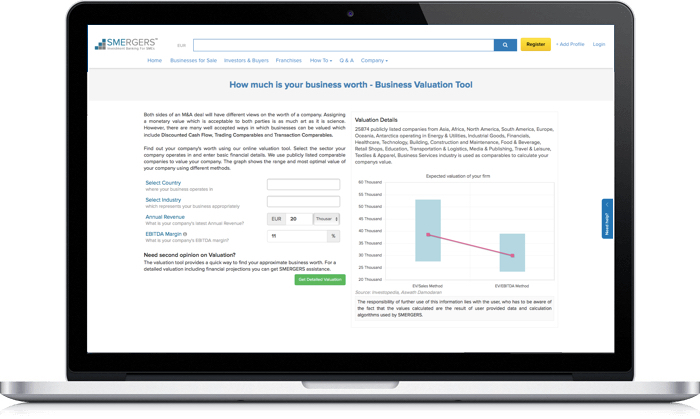 The Business Valuation Calculator available on their website and is free to use. Digital exits is a business broker that concentrates on online companies making an annual profit of $100,000-$3,000,000. While their main business is helping business owners to sell their companies, they provide free valuation services as a part of their business. Unfortunately they do not disclose the details of the business valuation process on their web site. Free valuation is offered, but no additional pricing info is given. Black Hill Federal Credit Union – A simple valuation calculator based on EBITDA and growth rate. MassMutual – A very simple calculator of BV. It takes only 2 to 5 minutes to complete the valuation. Are we missing something? If you know of a service that you think deserves a spot on this page, you can submit it for review here.